Sweet and sticky, TGI Friday's Jack Daniels glazed meatballs are a restaurant favorite. No Spoon Necessary has created a copycat recipe that is spot on that you can make this dish at home whenever you please. 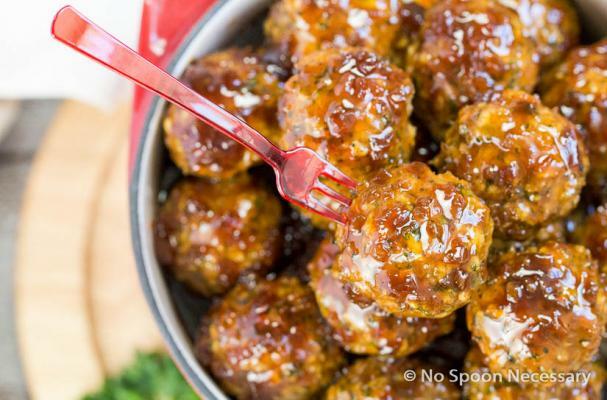 When preparing these meatballs, it is important that you use ground chicken that is made with both light and dark meat. The reason for this is that the additional fat keeps the meatballs moist. That being said, you can easily make this same recipe using ground turkey or other ground meat. Jack Daniel's glazed meatballs make for great party food or perfect served over rice.